It’s basically a Flappy Bird clone as a metaphor for navigating an academic career. I thought of this idea about a month ago but prob would have never gotten to without this #gameaweek challenge. I then followed the tutorial to make the basic clone and then tweaked it. First I created my own art. I already had the prof-on-hoverboard sprite (basically, as an in joke nod to the fake hoverboard video going around right now). I made the sprite using this awesome pixel art editor called PyxelEdit, and since that turned out well, I started drawing the pipe replacements in it, too. I figured, I’d use stacks of books and papers that the academic had to dodge through, but then got stuck a little when I realized that it wouldn’t work for the top set of pipes since books tend to fall rather than stick to ceilings. Anyway, I was thinking of doing cobwebs or doorways for the top set of obstacles, but while searching for art for the bottom stacks, I decided that hanging bookshelves would work! Finding a background image took a while, too, since I realized having free floating shelves in the original outdoor setting would look a bit weird. So, I found a nice wood texture and created a wall with a window in it that would scroll along with the books, still showing off the nice clouds outside. Ok. 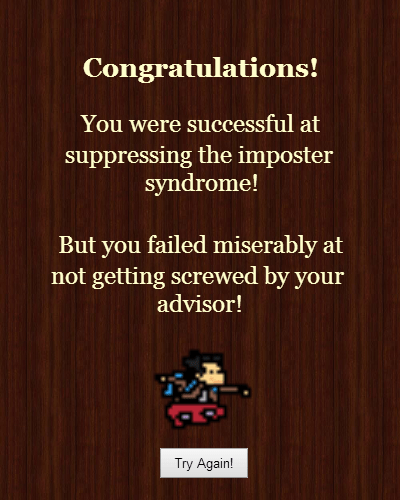 I had the art in place, but I really wanted the game to emphasize the (cynical) life of an academic more than just being hard. Instead of a point score (which was in the original game) I decided that each stack you had to make it past would represent a milestone along the career of an academic. Once that was decided, I used a Google Doc to write down 30 milestones (actually the same Google Doc that I store general game ideas in… I hope to tackle most of them for this #gameaweek thing), starting with passing the SAT to finally getting tenure and making a difference in the world. I also decided to make the game start off relatively easy and get harder and harder. Each milestone’s opening got progressively smaller, until the very end. The very end might be impossible. I don’t know. I’ve never personally made it that far. To load up each milestone’s text, I had to look up how to do arrays in Construct 2 (and I used the same array for the width of each milestone!). So there you have it. My first game in the #gameaweek challenge. At some point, I decided to make it a while mouse down game vs. a on click game (You hold the mouse button down for as long as you want rather than clicking frantically). The next one will be a refinement of the space coop card game I’ve been trying to develop for a while now. Need to do a lot of art for it and incorporate some ideas I’ve basically been sitting on for like half a year.